Media Register keeps all your license and usage details in one location. 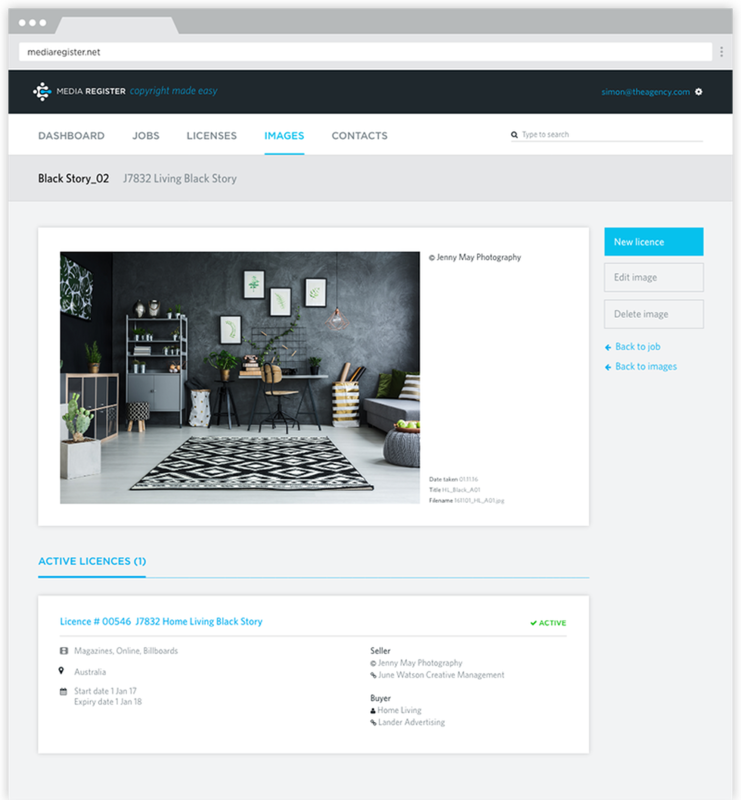 Easy to use, professional software for image buyers and creators. Create a license agreement in minutes. With Media Register, creating a license agreement is simple. 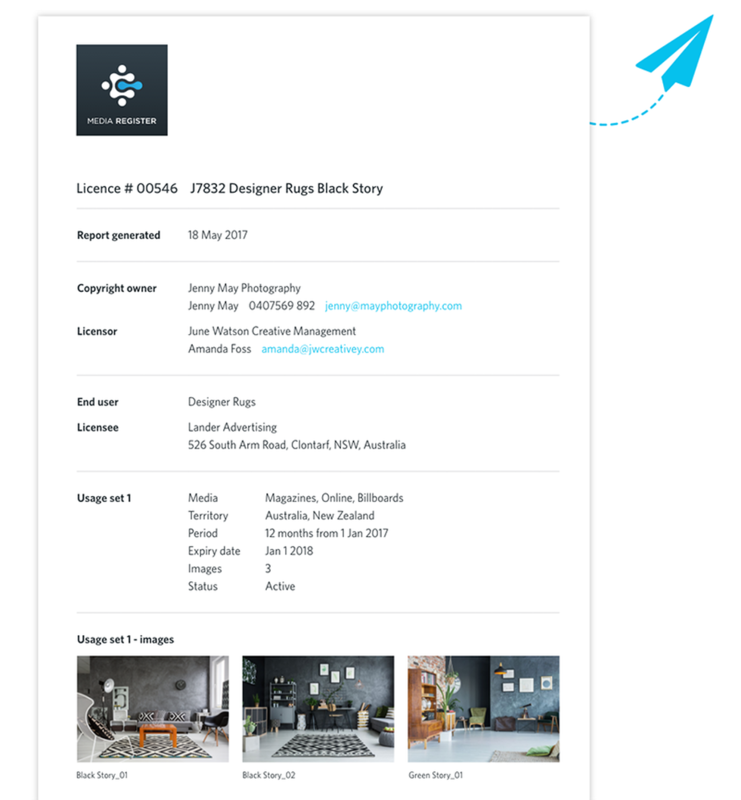 Define who the rights are licensed to, add the media, territory, period of use, then drop and drag images for a quick visual reference. Super efficient and easy to use. Share a license with clients and suppliers. Share all or part of your license agreement with others. Sharing enables others to discuss license details, add comments, send expiry notifications and archive or renew a license. Track your license agreements in one centralised location. Instantly confirm if an image is licensed, who it is licensed to and what it is licensed for. Our dashboard alerts you to recently added licenses, recently expired or due to expire. Our simple-to-use dashboard alerts you to recently added jobs and licence activity. Useful information on the license parties and assigned usage rights in one simple view. Know in an instant if an image is licensed, who it is licensed to and what is it licensed for. Create a new license or renew an old license with the click of a button. Impress your clients and suppliers with professional license documentation. For those in the business of buying and selling photography, keeping track of image licensing can be a tedious and labour-intensive process. 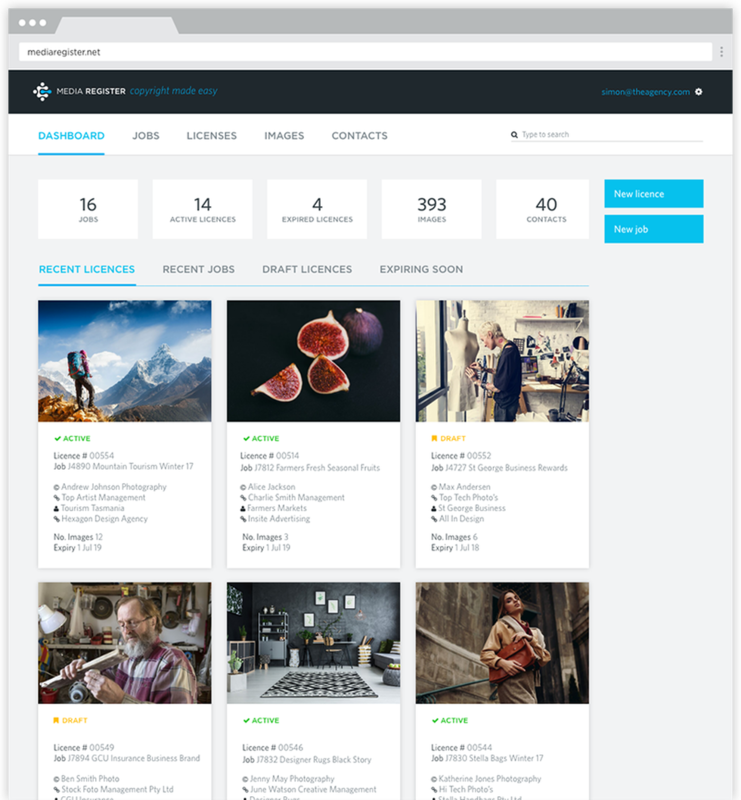 Media Register was created in response to a demand from photographers and their clients for a better way to track and manage rights licensed imagery. 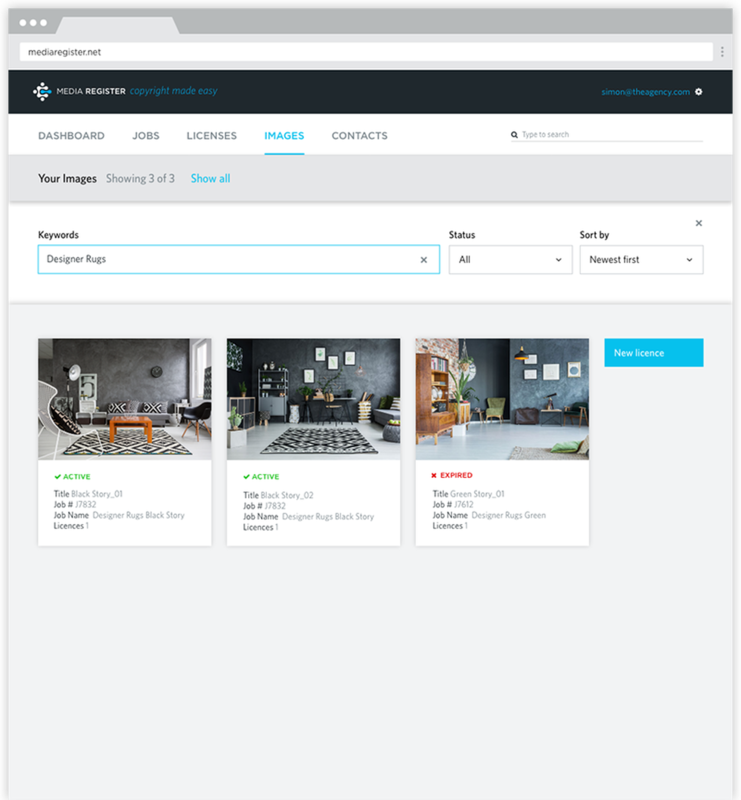 Our user-friendly interface is supported by a robust and sophisticated database that connects users with a platform for creating, sharing and tracking image license agreements. 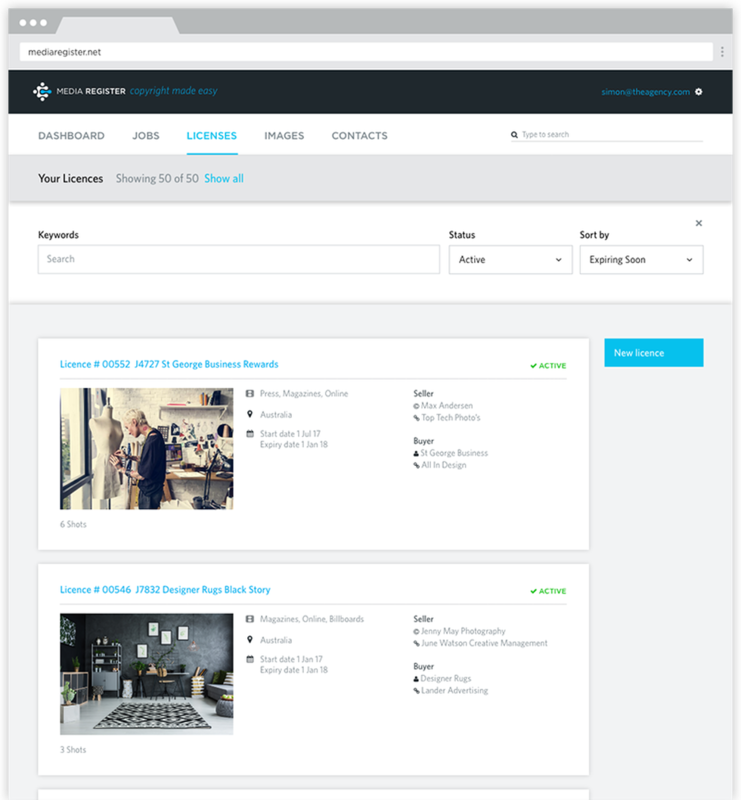 Designed to provide users with a new and improved experience when it comes to license record keeping, Media Register makes it easy for users to identify copyright information and collaborate around image licensing. Access all our features without spending a cent. No monthly subscription, no credit card required. All licenses created in the trial period are free forever.